Stat Crux Dum Volvitur Orbis. The Cross remains constant while the world turns. Those are the words of Pope John Paul II (Crossing the Threshold of Hope, p. 60) in a chapter addressing suffering. Often our suffering draws our focus from the Cross to ourselves and we forget that the Cross redeems all suffering ultimately. 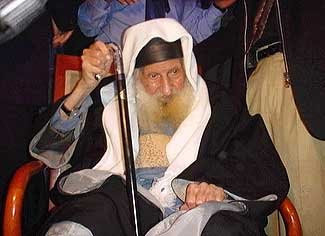 Before he died at age 108, Rabbi Yitzhak Kaduri left a signed note indicating Messiah's identity: Yeshua - Jesus. A few months before, Kaduri had surprised his followers when he told them that he met the Messiah in dreams and visions. Kaduri gave a message in his synagogue on Yom Kippur, teaching how to recognize the Messiah. Kaduri's manuscripts, written in his own hand, have cross-symbols painted all over the pages. Many attempt to explain the crosses by arguing that the great Rabbi Kaduri was not a Christian. We have no reason to believe he was. Instead, it appears that he was a Jew who accepted Jesus as Messiah. Only God knows. This we may safely assume: Rabbi Kaduri was wise and prayerful, and he knew the tradition of his Hebrew ancestors. Perhaps this led him to Jesus, the Son of God, at the sacred center of our cross-shaped reality. His ancestors were Horite Hebrew. For them the sun and the cross spoke of the Creator who had a son. The son is called Horus (Enki in Akkadian). Horus was the archetype of Jesus, the son of God. Both the sun and the cross are found on stone reliefs at the Temple of Horus in Edfu (shown below). 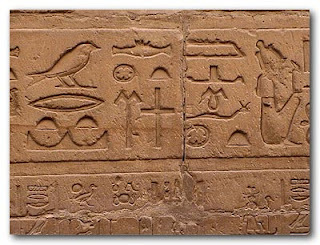 The relief also shows the sun resting over the banks of the Nile (directly below the bird). A variation of this image is the Hebrew horned altar, an apophatic solar image. The sun resting over a place or person represents divine appointment and blessing. The Canaanite Y is another example. 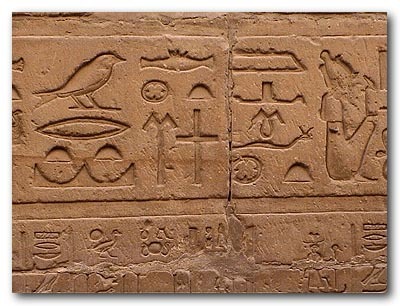 Horus was called "lord of the sky" in hieroglyphs at the beginning of dynastic Egypt (c. 3000 BC). His priest devotees were called Horites (Gen. 36) and one of the terriotries they controlled was ancient Edom, known as a seat of wisdom. This Egyptian temple of Horus closely resembles the pillared architecture of Petra. The ancient temples of the Sun cities had many pillars, typically at least 25. Entrance pillars were often named for righteous ancestors. The entrance pillars of Solomon's temple were named from his maternal and paternal great great grandfathers. Vertical pillars and horizontal entrance beams/stones form a cross, and as the entrances to the ancient temples faced east, the sunlight came into the sacred space through the cross. The Horite Hebrew regarded the sun as the symbol or emblem of the Creator. They are called Ha'biru in ancient Akkadian. The word is related to the Arabic yakburu, meaning “he is getting big” and to the intensive active prefix: yukabbiru, meaning "he is enlarging." This is a reference to the morning ritual of Horite Hebrew priests who greeted the rising sun with prayers and watched as it expanded across the horizon. This is the origin of the morning ritual whereby the sun is blessed daily in every devout Hindu home (Agnihotra) and the Jewish Sun Blessing ritual (Birkat Hachama) that is performed every 28 years. Aspects of the solar symbolism are found in the Bible and in historical texts. Psalm 92:2 describes the Lord as “a sun and a shield.” The Victory Tablet of Amenhotep III describes Horus as “The Good God, Golden [Horus], Shining in the chariot, like the rising of the sun; great in strength, strong in might…” (Tablet of Victory of Amenhotep III, J.H. Breasted, Ancient Records of Egypt, Part Two, p. 854). At the oldest known Horite Hebrew fortress at Nekhen on the Nile, the priests greeted the rising sun and placed prayers in the crevices of the rock. Consider how the boundary markers of Abraham's territory suggest intersecting lines that form a cross. First, the placement of his wives in separate households on a north-south axis. These settlements marked the northern and southern boundaries of the his territory. Sarah resided in Hebron and Keturah in Beersheba. For Abraham, the east-west boundaries were marked by water sources: Engedi to the east, and wells in Gerar to the west. Our experience of earth and the heavens suggests a geometrical quality of lines, angles and boundaries. The boundaries fixed by the Creator can be observed in genetics (horotely), climate cycles, and in time and space. Abraham's people respected the boundaries since they perceived of them as having been established by the Creator. Their religious and social practices reflect concern to distinguish the values of entities in the binary sets of Heaven-Earth; God-Man, Pure-Defiled, and Life-Death, and to serve the greater value. Consider how the residences of the prophets reveal the vertical and horizontal lines that form a cross. Abraham visited the prophet (moreh) at a great oak half way between the cities of Ai and Bethel (east-west axis). Deborah judged from her nut palm tree halfway between the cities of Bethel and Ramah (north-south axis). In our cross-shaped reality, there is always a sacred center. In the ancient world the sacred center of a territory was usually the shrine city, an elevated fortification near a water source. 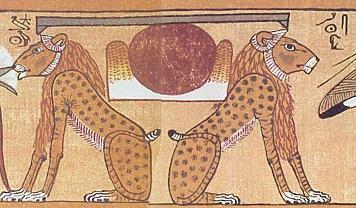 For the ancient Nilotes the sacred center was depicted in this image of the lions and the sun. We also may speak of a metaphysical sacred center. After his many years of deconstruction, Jacques Derrida concluded that there is a center and that there is a "presence" at the center. He claimed that throughout the history of philosophy this metaphysical presence is called by different names, including God. Materialists are baffled and perhaps frightened by this metaphysical presence since it must be of greater power and authority than they. There is existential angst about the possibility that expressions of authority depend on God's existence (Romans 13:1). A Facebook friend recently wrote that there are many ways to kill people, but the most certain way is to persuade them that there is no God, no Truth, and no morality. Pope John Paul II said that "the Cross remains constant while the world turns." Were we to investigate with seeking hearts, we would see Messiah's sign everywhere.